If you’re a seasoned customer of many years, or you’ve recently bought your first trailer from us, please let us know if you’re happy with it in the comments below. Could not have been more helpful. 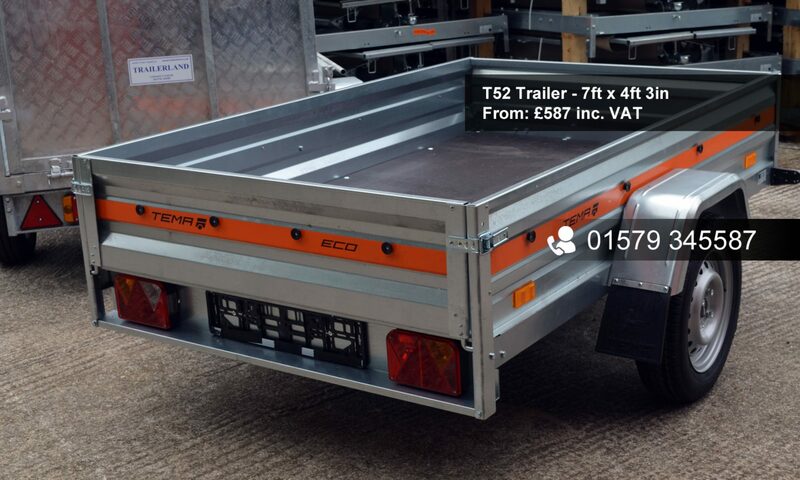 Matched trailer to required specification and added necessary accessories as required. I would recommend them without hesitation. Extremely helpful, very good service, full range of spares and accessories, highly recommended. Such outstanding service with excellent advice and service. I would also recommend them without hesitation. Andrew and Debbie have a wealth of knowledge about trailers and offer great advise when you tell them what you intend to use the trailer for or maybe you just need one for general use. The quality of the trailer I purchased is great and being a engineer know this trailer will probable out last me!! The trailer T82 8×2″ x 4×6″ 15cwt 15cwt with ladder rack Twin Axle I purchased from Trailerland is exactly what I wanted not only is it useful for all things I carry in it I find it easy to handle. On arriving at the site Andrew and Debbie assisted to hitch up and made sure lights etc were working properly.I recommend them for making the trailer which was most useful to me. Hi!i was a camper in trouble in the rain!!! i needed a trailer asap for the second week of wet camping in Cornwall. Trailerland could not have been more helpfull,they had the right spec trailer with optional canopy plus canopy bars. this company is most helpfull & really is a one stop shop! Nice people, good quality trailers at honest prices! big companies could learn a lot from the small business people in this world, they even stayed open until i arrived at 6.30pm what more could you ask for! thanks again. Cheers Steve. Very nice and helpful on the phone, said they’d ring back and they did within a few minute. Arranged exactly what i wanted and were very nice and friendly about it. Andrew was most helpful and friendly on the phone and although he didn’t have the trailer I wanted but was able to get me one in plenty of time for my first planned camping at an Agility Show. He gave me lots of advice on handling and keeping the trailer safe. His expertise is second to none! Thank you to Debbie too for showing me the right road home!! I would recommend anyone who is thinking of buying a trailer to look no further than Andrew and Debbie at Trailerland. Many thanks for a first class service. We went to see Andrew in order to buy a trailer. Not really knowing exactly what we wanted, he showed us around and gave us loads of helpful advice, we decided what model we needed, left him for the weekend and returned to find it waiting for us – even with the number plate fitted. After the paperwork, Andrew made sure we knew what we were doing before letting us loose on the roads. He couldn’t have been more helpful and I wouldn’t hesitate to recommend Trailerland to anyone requiring a decent trailer with first class service. I have just purchased a trailer form Trailerland. It is exactly what I wanted at a really good price. Thanks to Andrew for all his advice and time, nothing was too much trouble. I would recommend Trailerland to anyone for great quality trailers and brilliant servce. Don’t go anywhere else,Trailerland have the knowledge and experience needed to match the correct trailer to your requirements.My purchase from them was easy,they couldn’t have been more helpful.I am delighted with my new trailer,Reccomended. Just got back to North Devon with my new trailer, as everyone above said great service, good knowledge, nothing to much trouble extremely nice people. Trailed land the place to go many thanks. Andrew and Debbie provide a first class service – right product – right price – attention to detail. We will use them again. We bought our T50 last summer when we were in the throws of moving, our new home needed far more work than we had anticipated. Andrew was quite correct in the trailer he sold us, it has been a much used and perfect in every way – more than paid for itself and taken copious loads to our local tip. We’ve used it to remove kitchen equipment and cupboards, all the used flooring in the house and the amount of garden vegetation removed has been huge!! At one time we felt that the tip was our second home. We have used it to transport garden soil and compost as well as gravel. As promised by Andrew we have never had the size queried by the gents at the tip!! We are now looking to actually store it in the tipped mode in the garage!! That way we can also get the car in! We have had previous trailers but never one as versatile, we bless the day that we bought it fromAndrew. He totally knows his excellent products and sells them with clear instructions for use. It’s taken us a while to get round to writing this, but in the past months we have truly found this trailer to be the most useful item that we have owned!! Looking for an Anssems GT 750 with hard top – is this something you have available, and if so what is the cost please?